President Ram Nath Kovind on Wednesday said the commemoration of the 150th birth anniversary of Mahatma Gandhi should become a moment of making a fresh commitment to his goals of a just, honest and fair society at home and abroad. Kovind said the focus of the commemoration — which will run for two years from October 2, 2018 to October 2, 2020 — should not just be on events, but on tangible, actionable legacies that will make a difference to the lives of ordinary people. 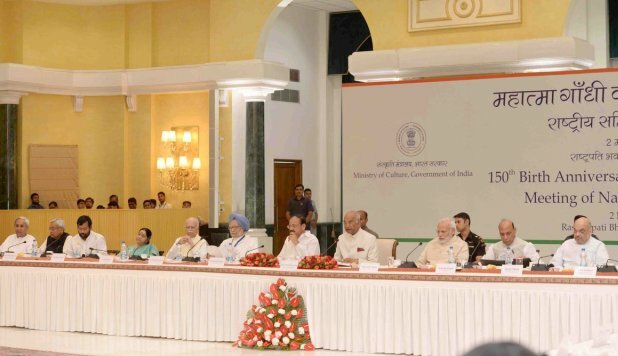 “The Mahatma is our past, our present and also our future… So many of the themes and ideas he spoke and wrote of – some of them far ahead of their time – are even more relevant today,” the President said after he chaired the first meeting of the national committee for the commemoration of the 150th birth anniversary of Mahatma Gandhi. During the meeting, it was decided to set up a smaller executive committee, headed by Prime Minister Narendra Modi, to take forward the commemoration, since it would not be feasible for the entire national committee to be convened frequently, an official statement said. The national committee has 125 members, including the President, Vice President, Prime Minister, Union Ministers, former Prime Ministers, Chief Ministers, senior MPs and political leaders from across party lines, and eminent Gandhians, social thinkers and activists. The committee also has nine international members, including two former Secretaries General of the United Nations – Kofi Annan and Ban Ki-moon – and Nobel laureates Archbishop Desmond Tutu of South Africa and US former Vice President Al Gore. Modi said it was important that this occasion be celebrated in a manner that ensures Mahatma Gandhi continues to be an inspiration for future generations, adding that with his timeless teachings, Gandhi can become a mechanism for people around the world to understand India. He emphasised the need to use technology in the celebrations so that the whole world can take note and participate and called for the celebrations to move beyond government events and take the shape of a mass movement – or ‘jan bhagidaari’. He also urged all state governments to have similar consultations and draw plans. In his speech, Kovind stressed that Mahatma Gandhi does not belong to India alone but remains one of India’s greatest gifts to humankind and his name finds resonance across the continents. The President said when one works for an India free of caste and religious prejudice, one invokes Gandhi. “When we strive towards ‘Swachh Bharat’, and a cleaner and more hygienic India… When we speak of the rights of women and children and of civil liberties of small and disadvantaged groups, we invoke Gandhiji. “When we build capacities in solar and renewable energy… When we battle climate change and promote green, eco-friendly living, we invoke Gandhiji,” the President said.